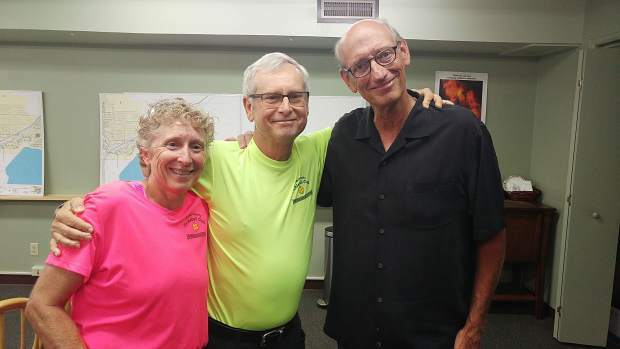 On Tuesday, July 11, Silverthorne resident Jim Schultz was playing pickleball with some friends at Rainbow Park when he started to feel light-headed. He chalked it up to dehydration and chose to sit out the next round. Schultz’s friends thought that was odd — he’s never been one to pass on a game. Minutes later, he was unconscious, having suffered a severe “widow-maker” heart attack. Luckily for Schultz, his friend Lori Miller was there, who happens to be the former chief of the Red, White and Blue Fire Protection District and has more than 27 years of first responder experience. When she saw Schultz was down, her training immediately took over; she carried out CPR, got a defibrillator on scene and coordinated the response that saved her friend’s life. “If it was somebody that didn’t have the training there wouldn’t have been a chance, not one in a million that I would have been saved,” Schultz said at an event hosted by Lake Dillon Fire-Rescue last week to highlight the heroic efforts that saved him. For all of Miller’s years of experience, that episode on the Silverthorne Recreation Center pickleball courts was still a harrowing experience, one that serves as a reminder of how a quick response and the proper training can in an instant become the difference between life and death. Although Miller was the first to recognize that Schultz needed immediate medical help, his rescue was a team effort where just about everything went right. A tennis instructor who was nearby radioed to the recreation center front desk, and lifeguards soon came running with an automatic emergency defibrillator while Miller gave Schultz CPR. A Silverthorne police officer also helped while firefighters sped to the scene, arriving in less than four minutes. They rushed Schultz to St. Anthony Summit Medical Center in Frisco, where he was then whisked away via Flight For Life to a hospital in Denver. All told, it took just 76 minutes to get Schultz in front of a surgeon. The goal for similar cardiac emergencies is 120 minutes. Schultz was on his feet and on the mend in just a couple of days after emergency surgery to place two stints in his heart. It was then that he truly grasped how narrowly he survived. Having an AED on scene was a crucial supplement to Miller’s CPR skills, and Lake Dillon Fire is using Schultz’s story to encourage more businesses and gathering places to acquire them. Schultz is still recovering, but his convalescence has been easier then he expected given the severity of his heart attack.